this casserole is a healthy delight! This healthy veggie casserole is terrific. You can use a lot of things to flavor your food. So many foods today are prepared with fatty sauces and a lot of salt for added flavor. This veggie casserole uses neither. It is made so delicious by using wonderful herbs such as oregano, basil and dill. Combined with the other ingredients it all comes together to produce a delicious blend of flavor and hearty goodness! 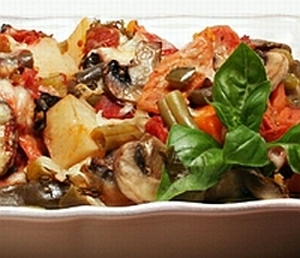 So if you are looking for a great tasting, healthy veggie casserole recipe this is your baby! Try it. You're gonna love it! Place all ingredients, except cheese, in large bowl and toss to combine. Remove from oven; turn broiler on high. Sprinkle with cheese. Broil until cheese is browned and bubbly. Per serving: 120 calories, 3 g total fat (1 g saturated fat), 20 g carbohydrate, 5 g protein, 4 g dietary fiber, 105 mg sodium.